In this life-giving book, Paul Tripp offers parents much more than a to-do list. Instead, he presents us with a big-picture view of God’s plan for us as parents. 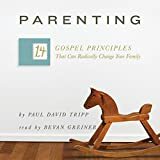 Outlining 14 foundational principles centered on the gospel, he shows that we need more than the latest parenting strategy or list of techniques. Rather, we need the rescuing grace of God – grace that has the power to shape how we view everything we do as parents. Freed from the burden of trying to manufacture life-change in our children’s hearts, we can embrace a grand perspective of parenting overflowing with vision, purpose, and joy. This entry was posted in Parenting Books and tagged Change, Family, Gospel, Parenting, Principles, Radically by PIYC. Bookmark the permalink.